Our groundbreaking Long Bore CMM provides a solution to one of the last great challenges in Metrology; that of offering precision measurement down long or deep bores. Specifically developed for the measurement of tubular items for example; jet engine shafts, undercarriage components, power generation plants, oil industry and defence requirements. The Long Bore Measurement (LBM) is patented in areas critical to its precision. Eley Metrology Ltd has for forty years offered world-class products and continues to be at the forefront of metrology developments. As worldwide demand continues for better quality solutions, the LBM demonstrates Eley’s expertise in this field. 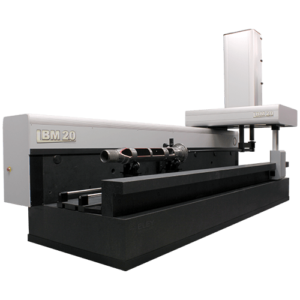 The LBM is unique and offers a solution to an area of Metrology that has always presented a challenge i.e. the precision measurement of features down long deep bores. The machine is totally designed and manufactured by Eley Metrology. Applications include: aerospace components like main engine shafts, hydraulically operated under-carriage landing gear, nuclear reactor items, oil industry components, line bored bearing housings and indeed any component where the precision measurement of features inside long deep bores are of interest. Perhaps one of the best examples is highlighted by the critical requirements of a jet engine main shaft. Such a component will be required to rotate in use possibly at 20,000 rpm. The centrifugal forces involved are immense. It is vital that the geometry and size of such a component is in compliance with the engine designers exacting specifications and requirements. Concentricity of inner and outer shaft bearing diameters are critical along with the blend radii of various internal and external diameters. All features must be measured in relationship to the centreline of the shaft. Any out of tolerance will cause serious vibration problems with possible catastrophic consequences if not identified before build of the final engine assembly. • Concentricity between inner and outer diameters. • Circularity and Cylindricity measurements. • Fillet radii between diameters. • Straightness and parallelism for component centre line datum. With previous old measurement procedures, composite measurement reports were produced employing dial indicators and gauging techniques. Often the budget for uncertainties of measurement alone could often take the component specification outside the available tolerance band. This is why the LBM was conceived. With greater demands for precision by designers along with more superior manufacturing machines, so the need for more accurate and certain measurement had arrived. This we might say is how progress is made! • The Y and Z axis are within two microns of straightness and parallelism. The LBM smallest diameter lance can pass through a bore as small as 20 millimetres diameter in order to measure a feature. The LBM is equipped with two Z spindles called Primary and Secondary. They are constructed in a parallelogram providing essential stability to the Z axis of the LBM. The guidance system is that of a Vee-flat configuration and employs patented air-bearings that are pre-loaded throughout. The LBM can measure from beneath the Primary Z spindle and so can offer convention CMM measurement. The same datum can be used to that of the touch probe at the end of the main lance. The LBM does not employ any error mapping or computer correction. UKAS Certification and Volumetric Specification is therefore achieved without this. Precision Straightness and Squareness of machine geometrics are derived from the excellence demanded at the manufacturing stage of the main guides. The X axis guide has a specification of seven microns total and the Y and X axes is produced within two microns total. To supplement the ISO 10360 standard, Eley Metrology carry out further verification employing a system of traceable Master Ring Gauges set in a fixture. Each ring carries certification of the main Internal Diameter and Concentric External Diameter. The object of the Master Rings is to replicate the measurement problems created by a precision tube. Therefore, demonstrating the ability to display Diameters, Internal and External and their concentricity’s. In addition to quantifiable examples with respect to wall sections of components. Applications include aerospace components such as main engine shafts, hydraulically operated under-carriage landing gear, nuclear reactor items, oil industry components, defence systems components and line-bored bearing housings. The Precision Long Bore CMM is manufactured to customer requirements. As standard, our comprehensive after sales and support team are always on hand to ensure your LBM is operating correctly. If you’d like more details about the Long Bore Measurement (LBM), then our team are available to help.